Dakota Plains Auctions wraps up their auction year with a 2 day auction on December 28th and 29th, 2018. Over 670 lots will come through the auction block for live bidding. 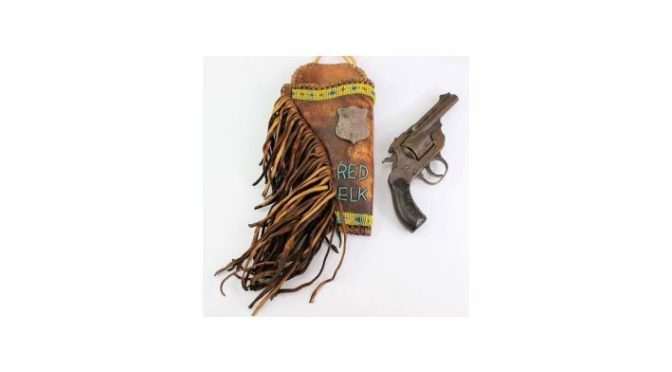 Included are firearms, cowboy collectibles, chaps, saddles, spurs, boots, hats, beadwork and more. There is also a selection of artwork, antique advertising, glassware and furnishings, and many more great antiques for any collector. Register early to beat the rush and get in bids as soon as possible. Day 1 highlights a Henry Barmit .17 HMR rifle at Lot 53. This is a lever action rifle with a 19 inch barrel and remains in “fine as new” condition. It even includes the original box. The serial number is V048918H and it is estimated in value of $350 to $475. Lot 67 is a beautiful fringed leather holster with factory engraved Eastern Arms and a .32 cal revolver. The action in functioning and it shows gray brown overall patina. This great value has a a pair of beautiful photos to view in the online catalog. Bidding starts at only $100 in the online catalog. The auction kicks off for live bidding on Friday night December 28th at 5:30 PM Mountain Time, and again on Saturday the 29th at 10AM Mountain Time; presented by Dakota Plains Auctions. They will present a live audio and video feed to give the worldwide audience of bidders a great part in the auction day. Absentee bidding is currently happening, and registrations are open. Dakota Plains Auctions will be happy to answer any questions about the online catalog via telephone or email.